Eroni Kumana found Lieutenant Kennedy and his crew six days after the wreck of PT-109. 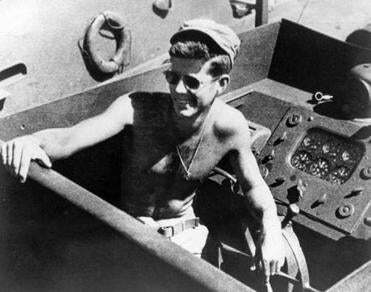 A fireball bloomed, and the Navy gave up John F. Kennedy’s PT-109 crew for dead. But Lieutenant Kennedy fought, swimming for hours with his 10 remaining crewmembers, pulling one along by holding his life jacket strap in his teeth. 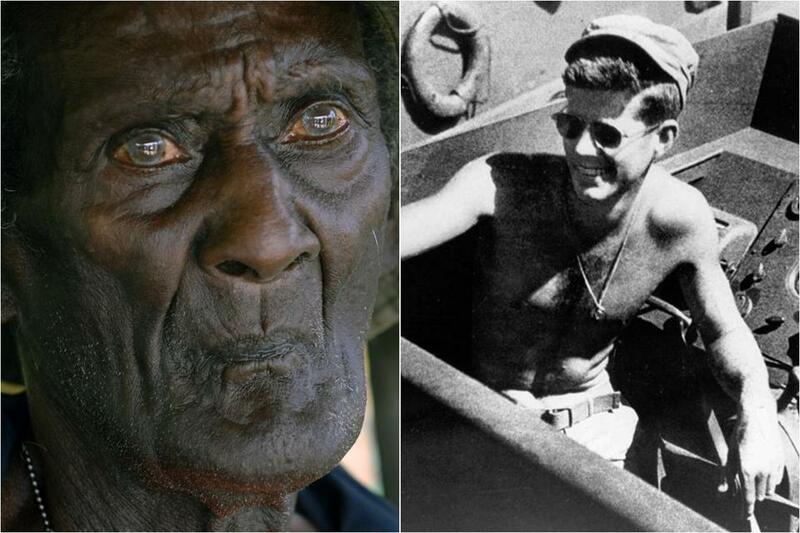 Kennedy’s heroics may have been for naught without Eroni Kumana and Biuku Gasa, two Solomon Islanders. They found Kennedy and his crew six days after the wreck, subsisting on coconuts on a small island. The two took a message from Kennedy, which he etched into a green coconut, and paddled at great risk 35 miles through Japanese territory to deliver it to the nearest Allied base. A rescue was launched. The crew, and the future president, were saved. Gasa died in 2005; Kumana died last week. “The last connection to this pivotal moment in history has passed,” said Thomas J. Putnam, director of the John F. Kennedy Presidential Library and Museum. The former president’s nephew Max Kennedy met Kumana in 2002 while on a National Geographic trip to the islands, not far from Papua New Guinea, to search for the remains of PT-109. A long boat ride was made easy with Kumana’s frank humor, he said. But Kumana’s laughter often turned to tears when the president’s name was mentioned. Danny Kennedy, an American, has run a dive shop in Gizo, near the site of the patrol torpedo boat wreck, since the 1980s. He often connected Kumana with visiting journalists and tourists, hoping to keep Kumana’s story alive. Kumana, whose cause of death was not immediately available, never knew precisely how old he was. He was a teenager when he canoed through those dangerous waters. He and Gasa were working as coastwatchers, tracking Japanese presence in the islands for the Allies, when they came across the PT-109 crew. Carrying Kennedy’s message — “NAURO ISL/COMMANDER/NATIVE KNOWS POS’IT/HE CAN PILOT/11 ALIVE/NEED SMALL BOAT/KENNEDY,” written on the coconut he had plucked — meant risking torture or death. Kennedy was awarded the Navy and Marine Corps Medal for his courage in guiding his men from island to island after their boat was sunk by the Japanese destroyer. Those who knew him say he never forgot those days, or Kumana and Gasa. Putnam said the actions of the islanders are hard to overestimate. “They certainly did help save [the crew’s] lives,” he said. And Kumana never forgot Kennedy. A visitor to his Ranongga Island hut in 2008 found his home covered with newspaper clippings and photos of the former president. As Kumana spoke about Kennedy to Mark Roche, a Texan with a passion for World War II history, he swung from laughter to bouts of weeping and back again. Kumana’s son, named after Kennedy, translated while Kumana clutched a heavy bust of the president to his chest. “It was the highlight of his life, and he couldn’t really let go of it,” said Roche, 57, who spent a few hours with Kumana, whom he called a simple, brave man, as well as a war hero. Kumana entrusted Roche with a mission: delivering a Kumana family heirloom to Kennedy’s grave in 2009. Solomon Islands “shell money” is passed down through the generations, and the giant clam shell Roche brought to Arlington National Cemetery had been in the Kumana family for hundreds of years. Eunice Kennedy Shriver and a few other family members attended the private ceremony, where Roche placed the shell on Kennedy’s grave. It is now in the JFK Library, along with the coconut. Putnam said schoolchildren love the story of the rescue. From the romance of eating coconuts on a deserted island, to the heroics of the dashing young Jack Kennedy in the dark night, to the men on a canoe bearing a secret message, the story conjures a sense of wonder. Claire McNeill can be reached at claire.mcneill@globe.com.